Jeb recently uploaded an image of the Nether, with a very interesting addition to the usual block landscape - what appears to be netherrack brick! With 1.8 having brought a sizable number of new block types, the possibility of expanding the Nether even more is exciting indeed. Will the new brick be craftable? Will it be found in pre-existing structures, built by mysterious NPCs? Will it be neither of these things, yet something more exciting still? Keep an eye out! Looks like a bridge to me. 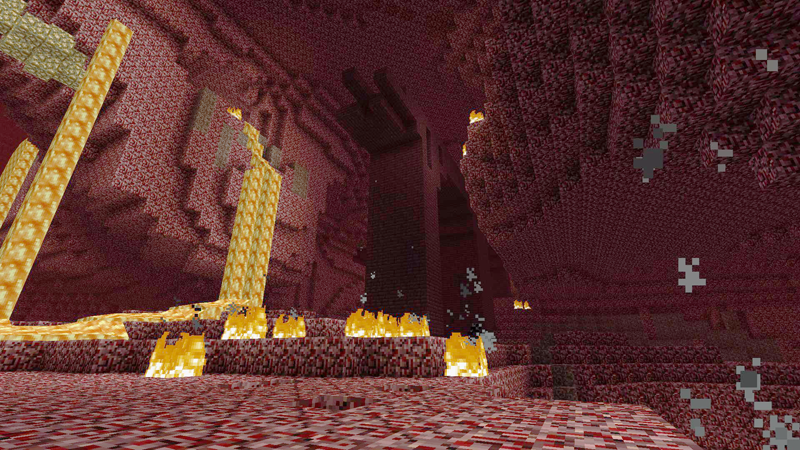 We don't need buildings though, we need a real reason to go to the nether. Everyone is entitled to their own opinion, an opinion cant be awful. Its an opinion. Its your opinion that his opinion is awful. I came here just in time, looks interesting! Oh, Nvm. See it now. I can't see this block everyone keeps talking about.. where is it?! wow guys you are BLIND!!! Its in the middle of the frikin image!!! If u see me run like the wind cause i'll use TNT to blow u away!